Exclusive to Verizon Wireless in the US, the Motorola DROID MINI, DROID ULTRA and DROID MAXX are three very closely related Android smartphones that should start shipping from August onwards. We will have to wait and see if there will be any non-Verizon variants of these devices coming to other markets. All three smartphones are almost completely identical except for the size of the display and the size of the battery. All three have a 720p HD display, a 10 megapixel primary camera and 2 megapixel secondary one, a 1.7GHz dual-core CPU and 2GB of RAM, 16GB of onboard flash storage, 4G LTE data and NFC. These DROIDs support both CDMA/EVDO standards and GSM/UMTS as well as LTE, and have a preinstalled nanoSIM card for roaming off the Verizon Wireless network. In the middle of the range is the DROID ULTRA with a 5" 720 x 1280 pixel panel and a 2130 mAh battery, coming in at 137 grams and measuring just 7.2mm thick. 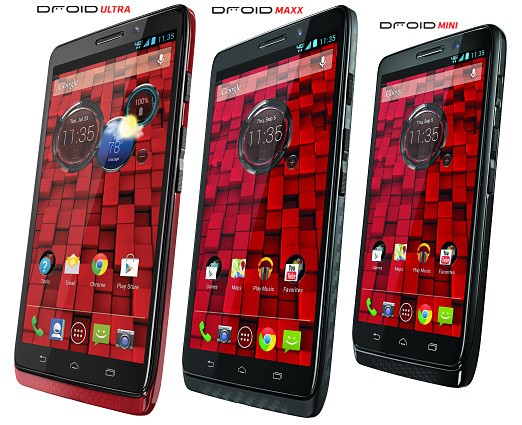 If you want a bigger battery, then the DROID MAXX adds a 3500 mAh cell and is 8.5mm thick and 167 grams. If both of those are too big, then the DROID MINI has a 4.3" 720p display and has a 25% smaller footprint than the ULTRA and comes with a 2000 mAh battery. The DROID MAXX and MINI also feature wireless charging, but the ULTRA does not. 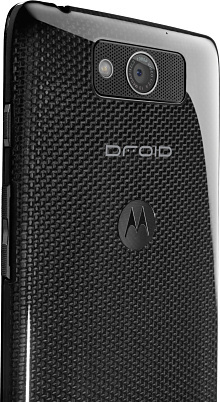 This DROID family features voice-activated controls, keyed to recognise the owner only plus a number of other software enhancements that are exclusive to Motorola. Underneath all that, these handsets run Android 4.2.2 and are capable of everything that every other Android smartphone can do. All these DROIDs have Motorola's distinctive Kevlar back, and a full set of sensors including a barometer, gyroscope, proximity sensor and accelerometer. It's worth nothing that the upcoming Motorola MOTO X promises even more sensors, but that's a little way off yet. If bought without a contract the MAXX costs around $700, the ULTRA $600 and the MINI $550. If taken with a new two year contract you can take $400 off those prices. There appear to be black, red and purple versions of these handsets and Verizon says that they should start shipping to customers from late August. Varies. 2000 / 2130 / 3500 mAh cell.